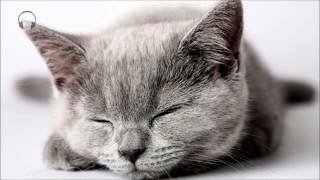 A cats purr happens as they inhale and exhale and that is what creates the two distinctive pitched and rhythmic sounds of a purr. Studies show the purr is the result of cats forcefully and rapidly vibrating the muscles of the larynx and opening and closing the glottis inside the voice box. A fully developed hyoid bone allows cats to purr. This bone supports the tongue and larynx muscles. Only one cat, the snow leopard, can purr without this fully developed hyoid bone. 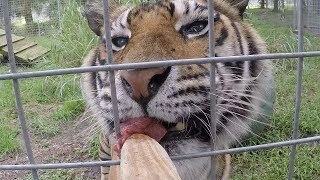 All other BIG CATS cannot purr and have only a partially developed hyoid bone. 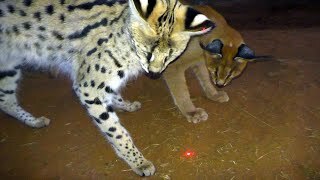 BIG CATS like leopards, tigers, lions, and jaguars can only roar. No cat can both purr and roar. 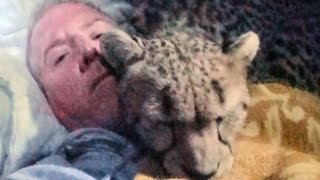 Know that nothing compares to the 'LIVE' sight, sound, and sensation of a cheetah that is laying on or next to you while purring because it enjoys your company, but I try and capture the best I can with what I have. 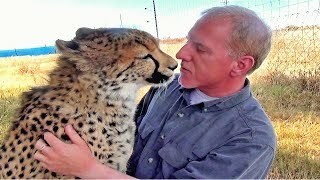 Enjoy 15 minutes of my favorite purring cheetah.... The Beautiful Eden.... they call her. You see her friend, Faith in the video as well, but she doesn't purr as much or robustly as Eden does. 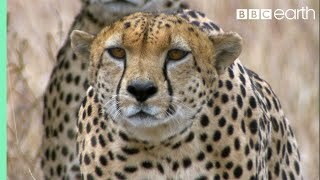 I discovered like any sound producing instrument, weather and humidity affects a cheetahs purr. 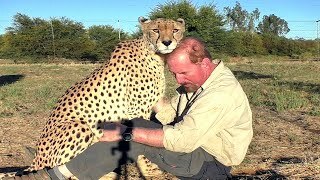 Winter purrs are the best as the cheetahs are not hot and panting as much. 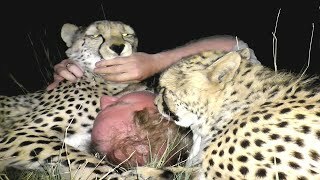 Cheetahs purring at night sound better because they are relaxed and there is less interfering outside noises. 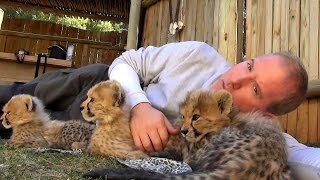 Cheetahs get very happy when sharing space with them inside their enclosure and come to share the warmth and company of human blankets. 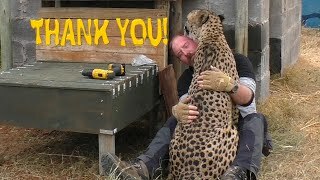 Never met a cat that didn't LOVE blankets  :O  Cheetah purrs inside their concrete boxes result in a greater resonating and louder purr. A cats purr is known to be therapeutic and healing. Cats purr because they are contented, hungry, happy, or in pain. 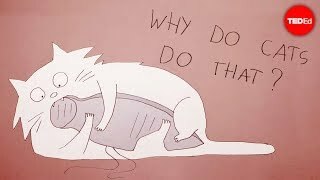 The frequency of a cats purr (20 - 120Herts) is known to heal soft tissue and bone and why a cat purrs when in pain, like a mother cat in labor. 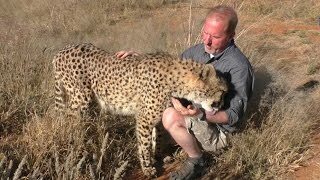 The strong and air vibrating sounds and sensations of a cheetah purr is mesmerizing to me. Besides the physical healing properties of a cats purr, I just love the rhythmic and relaxing sound of it; especially when it's purring because of my presence. It is a wonderful, rewarding, and exceptional sound to someone like me who prefers "white" background noises to sleep.